SEMANTiCS 2016 is hosted by the Leipzig University. The SEMANTiCS conference will take place on Campus Augustusplatz, which is in the heart of Leipzig's city center, which has undergone significant architectural changes over the past decades. Founded in 1409, and thus being the second oldes University in Germany, the University of Leipzig has influenced Leipzig's cultural and architectual image for more that 600 years. In the course of its diverse history, it has grown to encompass a wide selection of disciplines comprising almost all areas of knowledge, with a special emphasis on the humanities and the natural sciences. World-renowned scientists and scholars have taught or studied in Leipzig, and important impulses for the development of thought originated here. Over the last 600 years the University of Leipzig was a home to various remarkable personalities such as Johann Wolfgang von Goethe, Gottfried Wilhelm Leibniz, Richard Wagner, and Friedrich Nietzsche. The SEMANTiCS conference will take place on Campus Augustusplatz, which is in the heart of Leipzig's city center, which has undergone significant architectural changes over the past decades. The University of Leipzig has more than 28.000 students and since 2011 Dr. Beate Schücking is the principal of the University of Leipzig. She is the first woman who has ever held this position. Leipzig is the largest city in the federal state of Saxony, Germany, located about 200 km south of Berlin. Last year the city celebrated its 1.000 years anniversary. Since the middle ages, before the Magna Carta was drafted, even before the Crusaders sacked Constantinople, Leipzig (or urbs Libzi as it was first declared in 1015) was a cultural and commercial hub, with international connections situated at via regia and via imperii. In the second half of the 19th century, Leipzig became the forerunner of industrialization in Germany. The industrial architecture of the late Wilhelmenian era has become one of the city's attractions. 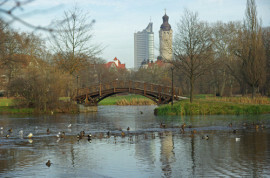 Leipzig has always been an important center of academia and culture in Germany and is probably most famous for its musical reputation on account of the works by Felix Mendelssohn Bartholdy, Robert Schumann and Johann Sebastian Bach. Today it is home to the world’s famous Gewandhaus Orchestra and the St. Thomas Choir. During the last decades of the previous century, Leipzig played a vital role during the fall of communism in whole Eastern Europe. Until today, events such as peaceful demonstrations, church services and the like instignated the reunification of Germany and are known as the peaceful revolution. The incredible boom during the past 10 years, with veggy cafes popping up here and there, a vibrant arts, modern music scene and start-up scene and more and more people moving to the city brought Leipzig its often quoted nickname Hypezig.